With train rides, live music and more, Railtown 1897 State Historic Park (SHP) in Jamestown is the place to be this Labor Day Weekend. 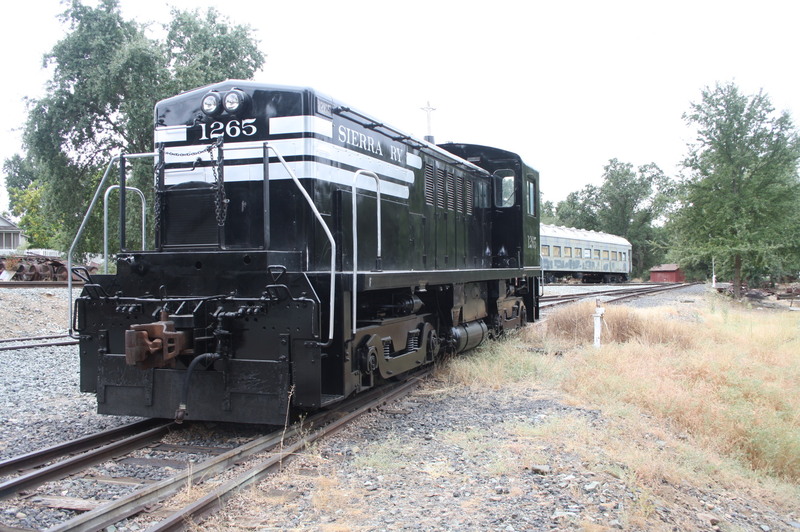 Popular excursion train rides will be available all three days (September 3-5) that include special rides behind the famous “Movie Star Locomotive” Sierra No. 3 on Monday only. 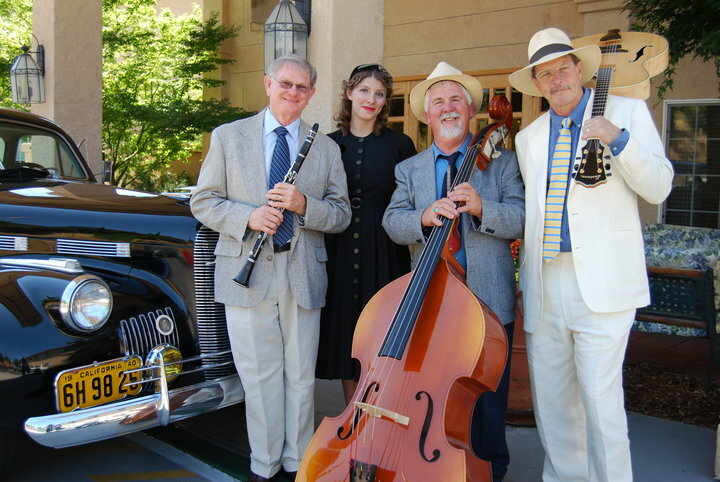 Live vintage jazz music by the Starlight Serenaders will also be offered from noon to 3 p.m. on both Saturday and Sunday, and fiddler Dave Rainwater will offer live musical entertainment aboard the trains all three days. In addition to the special holiday activities, visitors are encouraged to spend the day at Railtown 1897 SHP with picnic and barbecue areas available on the sprawling Roundhouse lawn. 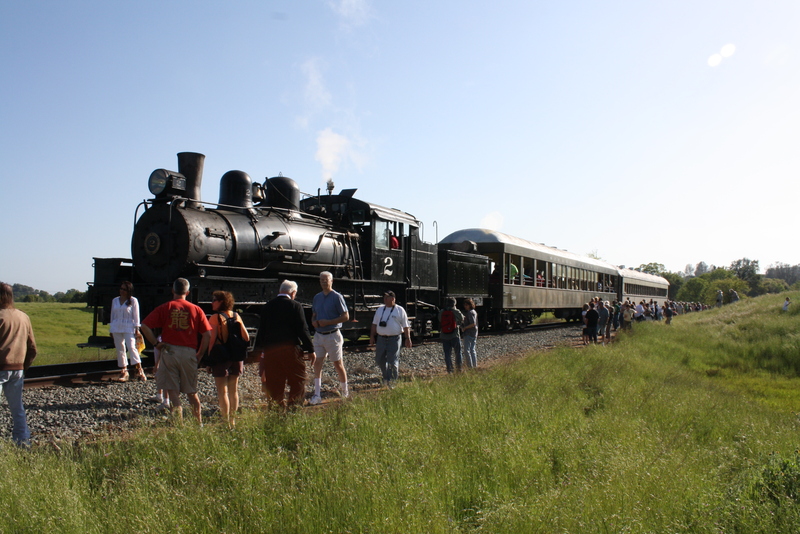 All tickets for the excursion train rides aboard “mountain observation cars” are $13 for adults, $6 for youths ages 6-17, and kids five and under are free. All tickets include Park admission and are available on a first-come, first served basis at the ticket window beginning at 10 a.m. on Saturday and Sunday. For Monday train rides behind Sierra No. 3, advance online reservations are recommended by visiting www.railtown1897.org. Regular Park admission prices apply — $5 for adults, $3 for youths ages 6-17, and is free for children five and under. 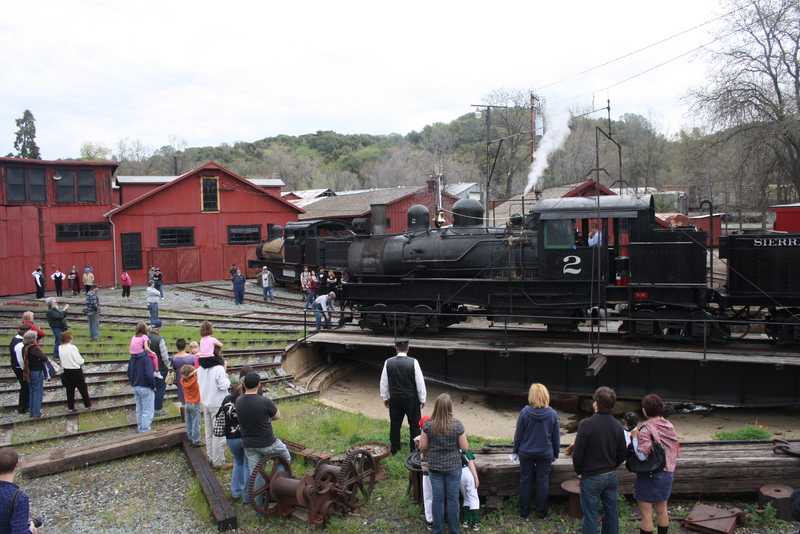 Guided tours are also available and are included free with paid admission or excursion train ticket. Don't forget to come before the first train (around 9:30) or after the last (around 4:00) to see the roundhouse and turntable in action! Santa’s Starlight Tickets go on Sale September 1st! Santa is taking some time out of his busy schedule to make special daytime and nighttime appearances at Railtown 1897 State Historic Park this holiday season. Special train rides with Santa will operate over the three-day Thanksgiving weekend (November 25, 26 & 27) and again the weekend before Christmas (December 17 & 18). Advance tickets to ride with Santa will go on sale September 1st. For two nights only — on Friday, November 25th and Saturday, November 26th — visitors are encouraged to bundle up and join Santa and his musical friends for two lighted Christmas trains departing at 5:30 & 7 p.m. The special train rides — lighted and filled with the music and magic of Christmas — will get visitors in the holiday spirit with live holiday music and caroling on and off the train. Greeted by carolers at the dock, Santa will arrive at the station aboard the Sierra No. 3, then join riders on a train of festively lit cars pulled by the Shay No. 2. Every child will have plenty of time to whisper their wishes to Santa as he and his elves make their way through the train, accompanied by live music onboard. Hot apple cider and refreshments will be available for purchase at the depot. 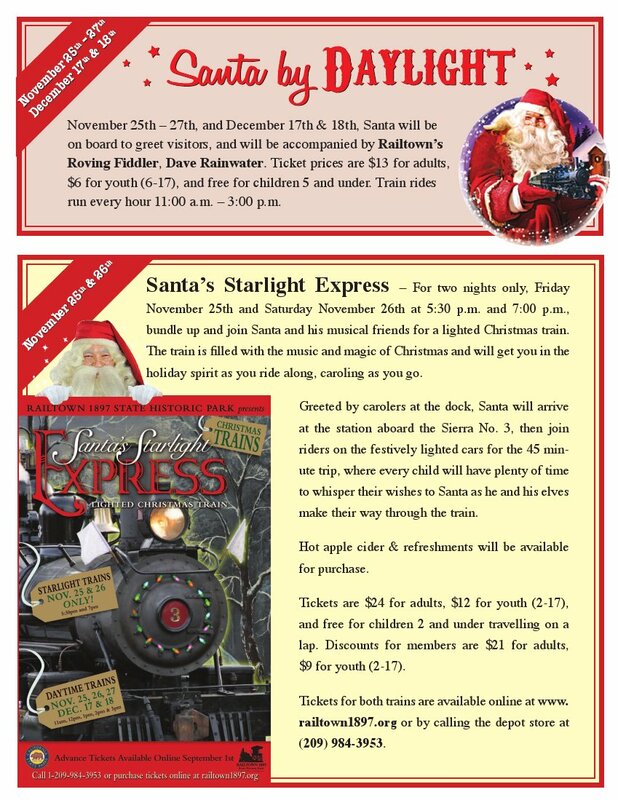 Tickets for the nighttime rides aboard “Santa’s Starlight Express” are $24 for adults, $12 for youths, and free for children 2 and under (traveling in a lap). Discounts are applied to members. Popular “Santa By Daylight” train rides also continue this year during daylight hours, on November 25, 26 & 27, and again on December 17 & 18. Trains run hourly from 11 a.m. to 3 p.m. Santa will be on board to greet visitors and will be accompanied by Railtown’s “Roving Fiddler” Dave Rainwater. Ticket prices are $13 for adults, $6 for youths, and free for children 5 and under. Advanced tickets are strongly recommended and are available online at www.railtown1897.org or by calling the depot store at 209-984-3953. 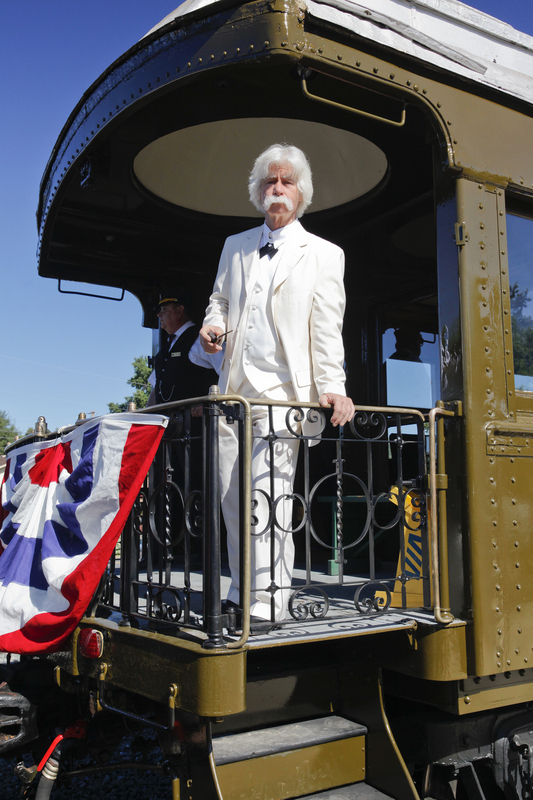 Mark Twain Train- July 23rd! 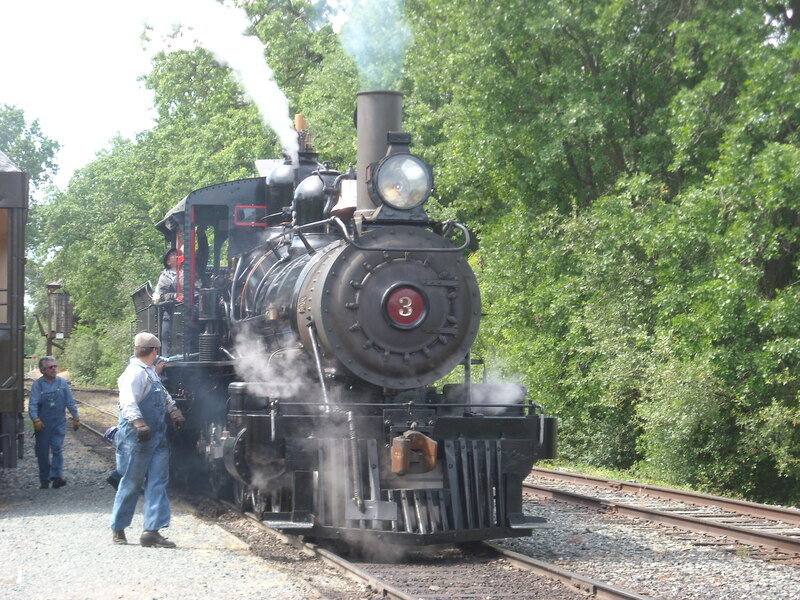 Get ready for a summertime favorite — it’s the Mark Twain Train Ride on Saturday evening, July 23, at Railtown 1897 State Historic Park in Jamestown! 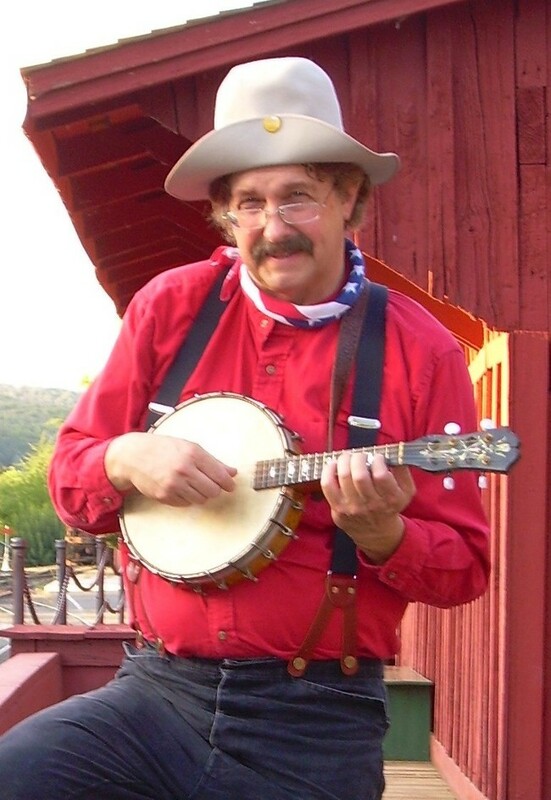 Get there early to listen to live music provided by local sensation Dave Rainwater and fascinating storytelling by Mark Twain himself (vividly portrayed by Pat Kaunert) beginning at 4 p.m. on the sprawling Roundhouse lawn. Then, the Sidewinder Express (No. 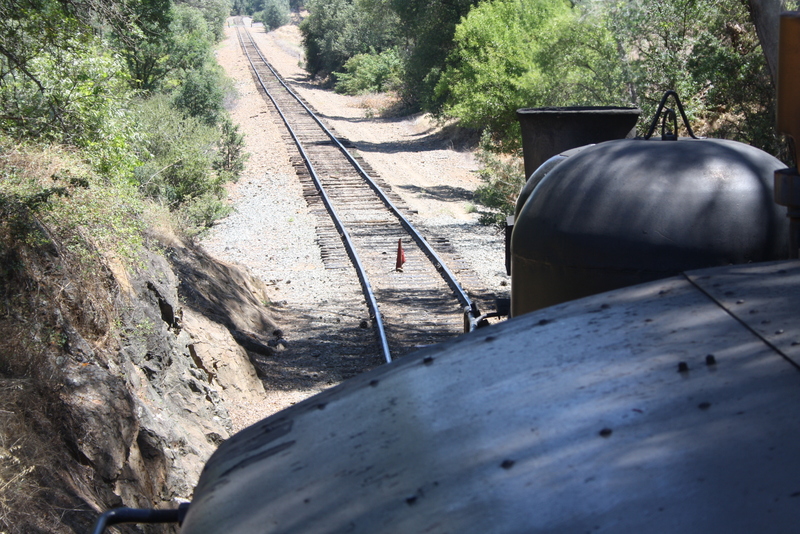 2 Shay) departs promptly at 5 p.m. for an entertaining and spirited train ride through the rolling Gold Country foothills. Bring your own victuals and libations to enjoy on board this lovely summer evening train. Advance tickets for are available online at www.railtown1897.org for the special Mark Twain Train Ride. Don’t miss the family friendly rail-related fun at Railtown 1897! For more information, call 209-984-3953. The General Code of Operating Rules (GCOR) is a set of operating rules for railroads in North America. It is used by a wide range of Class 1, Class 2, and shortline railroads, including UP, Amtrak, BNSF, and Railtown 1897 State Historic Park. Our engine crews ( including brakemen, conductors, firemen and engineers), must pass a written exam on GCOR annually, in addition to unannounced operations testing. Operations testing may include a variety of different “on the job” challenges. Most noticeable to riders of the train is the “Red Flag Test”. When a red flag is placed on the tracks, the train must stop, the engineer notifies the conductor. The conductor authorizes the train to proceed, only after confirming removal of the flag by the person (or class of employee) who placed it. The red flag is primarily used to mark the boundaries of working limits when maintenance of way crew are on the tracks, but can be used to mark any hazard requiring the train to stop. A red flag or red light is displayed where trains must stop. When approaching a red flag or red light, the train must stop short of the red flag or red light and not proceed unless the employee in charge gives verbal permission. If permission to proceed is received before the train stops, the train may pass the red flag or red light without stopping. If track bulletin Form B is not in effect, permission must include speed and distance. This speed must not be exceeded until the rear of the train has passed the specified distance from the red flag or red light, unless otherwise instructed by the employee in charge. Displayed Between Rails. When a red flag or red light is displayed between the rails of a track other than a main track or controlled siding, the train must stop and not proceed until the flag or light has been removed by an employee of the class that placed it. Red flag warning! Train stops. 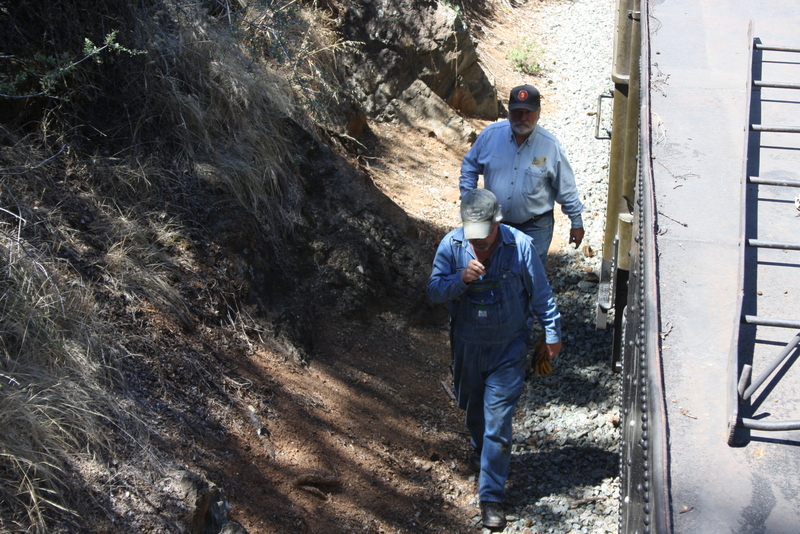 Conductor, Lenny G., and Brakeman, Warren S, approach the locomotive to confer. At the conclusion of the test, the flag was removed by DSLE (Designated Supervisor of Locomotive Engineers) Kevin Z., who placed the flag for testing. Today’s crew passed the test with a perfect performance. Although we rarely face actual red flags, it is important that we train for any eventuality. The all-volunteer train crew takes their responsibilities seriously, and approaches their jobs with a high level of professionalism and concern for the safety of the passengers and other crew members. Saturday April 16th, we will be running our hard-working Shay, No. 2, with trains at 11, 12, 1 2 & 3. With the beautiful weather, our consist will be: The 599 & 597 open cars, and the 14, closed car. The 597 & 599 are former Canadian Pacific cars, built in 1914, and the 14 car is a former Southern Pacific Pullman “Suburban” built in 1923. At 4:30, our final Wildflower Train of the season departs with park rangers from New Melones on board to intepret the wildflowers of the region. There are two planned photo run-bys as part of this train, which give visitors an opportunity for an intimate view of wildflowers, and experience the Shay No. 2 side gears, in action and close-up. Tickets are on sale at online until midnight Friday, or at the window on Saturday. On Sunday, we’ll be running our fuel-sipping, 1952, Ex-Army Diesel 1265 (nicknamed “Rosebud” by the crew). This locomotive came from the Rivebank Ammo Plant in 2006, and was brought back into service and painted last year by volunteers at the park. It will be pulling the same consist as Saturday. 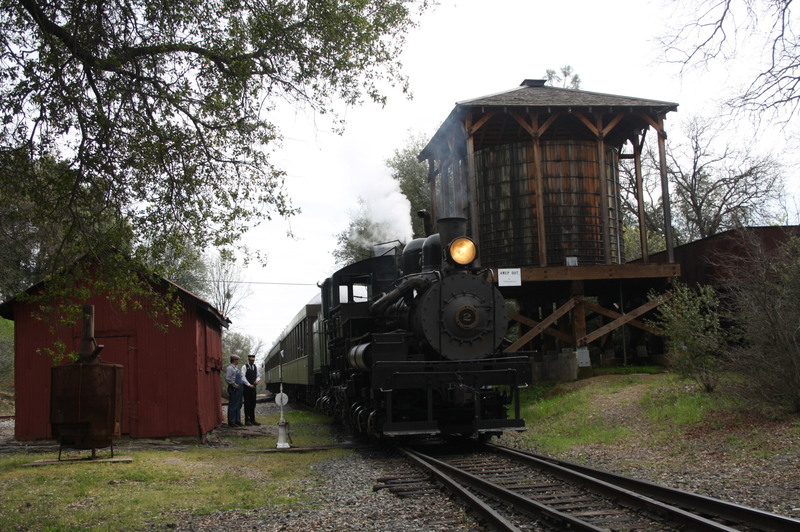 Also on Sunday, a private motorcar club, Motorcar Operators West, will be running from Oakdale to Jamestown, using the turntable and stopping over for the afternoon before their return trip. They are scheduled to arrive around 10:30 AM, departing just prior to our 2PM train. 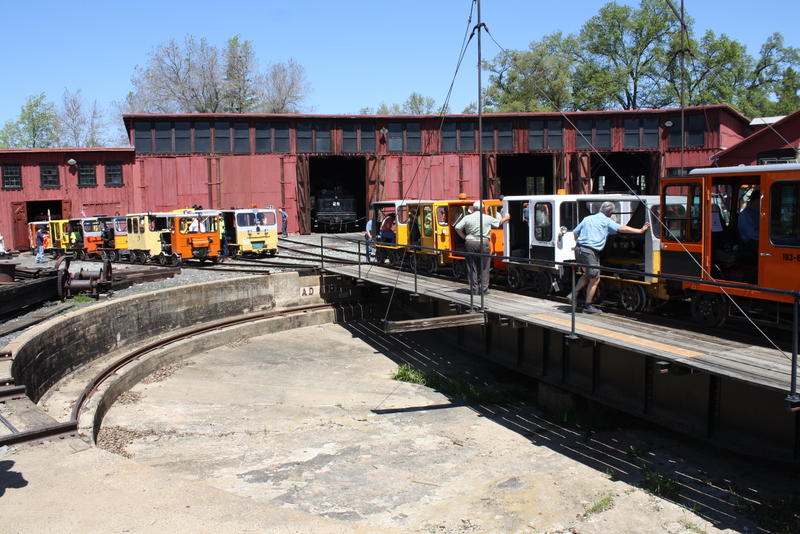 This is a great opportunity to see over 30 unique motorcars (track maintenance vehicles used prior to the advent of the hi-rail truck), and see the turntable in action. As always, don’t forget to come out and see the locomotive as it is brought out of the roundhouse and on to the turntable on Saturday morning around 9:30, and when it is “put to bed” right after the last train of the day. 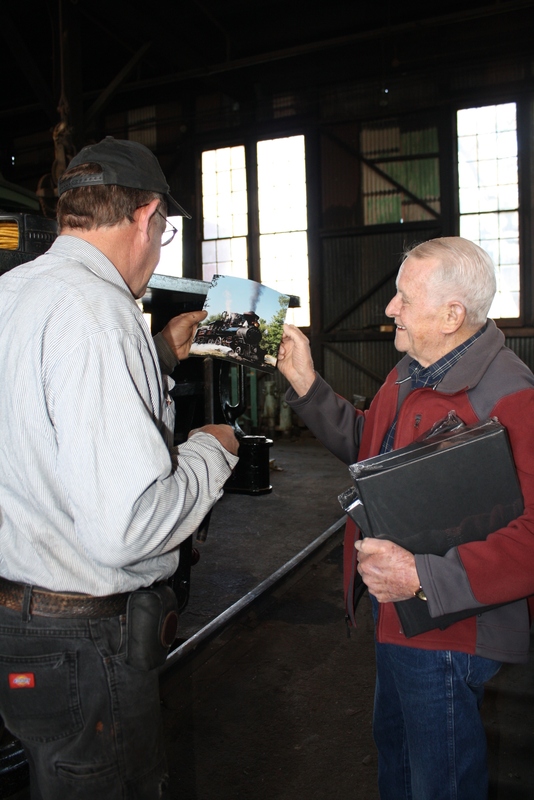 Warren tracks down George in the roundhouse to identify a photograph he's archiving. Tony and Phil measure for one of the final fitted bolts to be installed in the frame while the center drivers are out for cam installation. 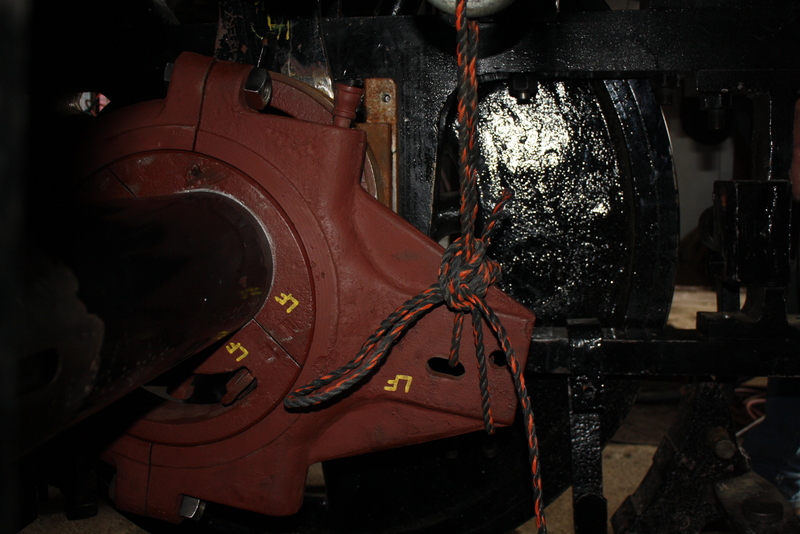 Oh, so that's a valve cam (attaches around the axle of the driving wheels). Ron Sloan looks on as David Ethier applies insulation to the #2 after recent staybolt repairs. 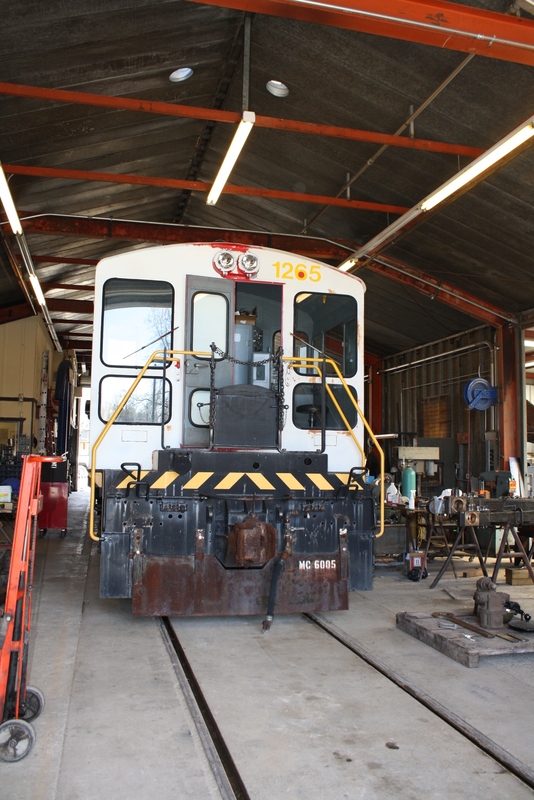 Ex-Army diesel 1265 waits in the Tri-Dam for a new paint job. Volunteer Ron Sloan demonstrates the challenge in accessing the #1 cylinder. 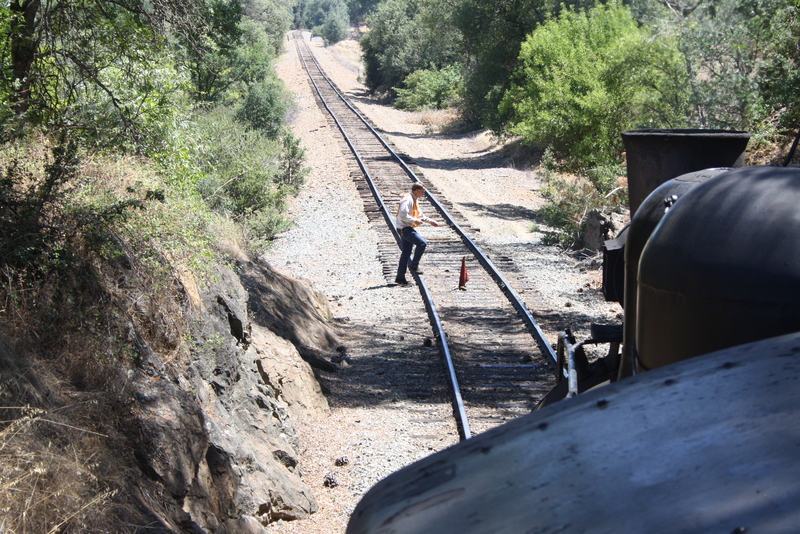 The current Sierra #2 Shay locomotive continues to challenge with unresolved performance issues. One thing is always certain–when the Shay needs work, Ron Sloan is there. 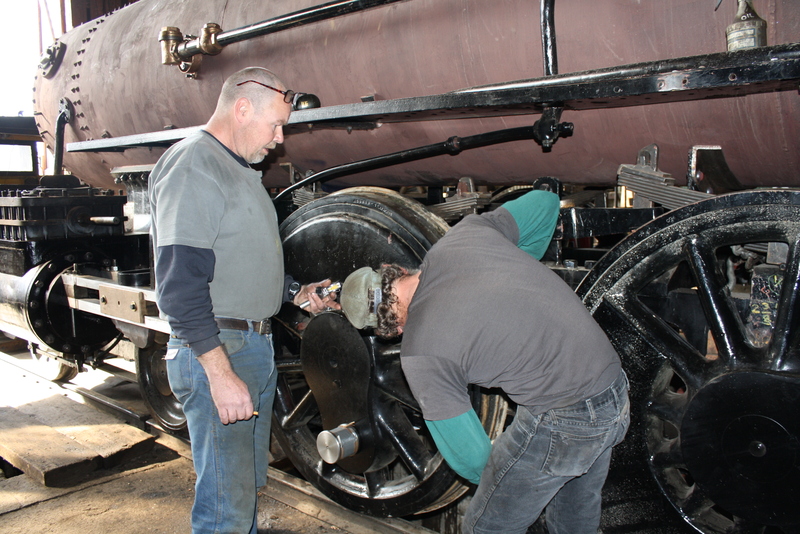 Ron might very well be the only volunteer at Railtown who worked on steam locomotives in the steam era. In his 20s, Ron worked as a locomotive fireman. Later, he had a successful career as a professional photographer. Since 1999 he’s been a volunteer at Railtown, working about 2 days a week (sometimes more) on the locomotive. Whether it’ll be running tomorrow or not, is still up in the air. Call 209-984-3953 for the latest update. 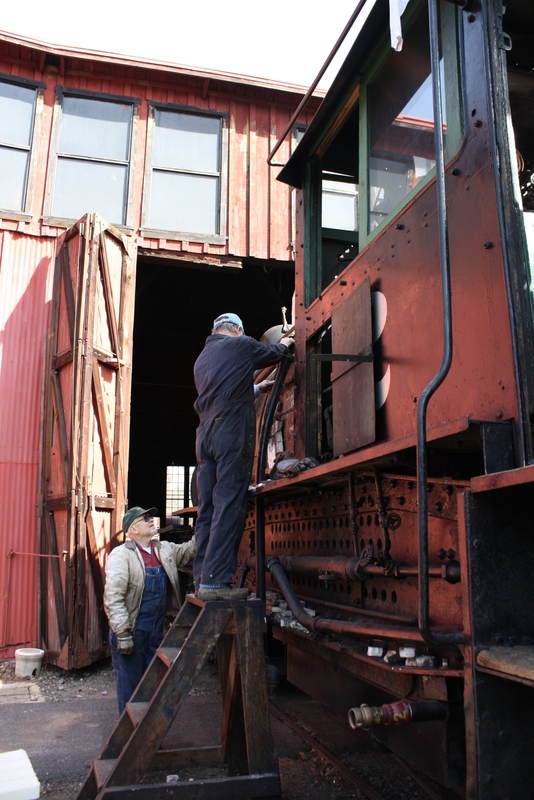 But, with volunteers like Ron, we’ll be running steam again soon, that’s for sure!